The other day I was in my local grocery store, reading labels like the food geek I am, when I wandered past the apple sauce shelf. I was shocked to discover that most of the jars contained not only apples, water, and some ascorbic acid (to keep the sauce from turning brown), but they also had High Fructose Corn Syrup (HFCS) in them. Each brand seemed to have one version that was unsweetened, usually labeled “natural” or “original.” But if you wanted chunky apple sauce or apple sauce with cinnamon, then you had no choice but to also accept HFCS. There were a couple of organic brands which did not have ascorbic acid in them (maybe organic lemon juice is expensive?). They also had sweetened and non-sweetened versions but used sugar instead of HFCS. Does anyone make organic HFCS? There’s an ironic food product for you. Why would anyone put sweetener in apple sauce? I mean sure, if you’re using older apples that have been in storage all winter then they might need a bit of a boost, but come on, apples are one of the sweetest foods in existence. Heck, a lot of “hippy” products are sweetened with apple juice instead of sugar. Oh, and even worse, the small 4 ounce cups of apple sauce meant to go in kids’ lunch boxes were all sweetened. I’m sure someone makes a “natural” lunch box apple sauce, but my store didn’t have any that day. When I got home from the grocery store, I was standing in the kitchen shaking my head over America’s apparent addiction to sugar, when I saw a bowl of apples on the counter. About half an hour later, I filled most of a quart-sized jar with homemade pink apple sauce spiced with star anise, cardamom, and cloves, no sweeteners here thanks. I used 6 apples and I wound up with about 3 cups of sauce. Apple sauce is one of the easiest things to make yourself and it’s fun to experiment with wild spice combinations, I think next time I’ll try some fresh ginger. Normally, I’m not a big kitchen gadget lover. I live in a small New York City apartment and gadgets must earn the right to live in my kitchen by proving they are truly useful at multiple tasks. One of the few gadgets granted this honor is my food mill. In summer I use it for making jams and jellies, it helps a lot in making really smooth cold soups like vichyssoise, and it’s really good for making apple sauce. If you have a food mill there is no need to core and/or peel your apples, just chop them into eight pieces each and that’s it. Once the apple sauce is cooked, you let it cool and then run it through the food mill which purees the cooked apples and removes the skin, seeds and spices. Leaving the skin on the apples makes the sauce turn pink, which I think is particularly attractive. I also think the skin and seeds impart more flavor to the final sauce. Apple sauce is a great staple to have around the house. I love stirring it into oatmeal in the morning, it’s a great side dish with pork, and you can use it for a quick dessert like apple sauce cake. Cut your apples into 8 pieces each and put them in a sauce pan with just enough water to cover the bottom of the pan which will keep them from sticking. If you do not have a food mill peel and core your apples before putting them in the pan. Add the spices. Cover and cook over low heat for about 15-20 minutes or until the apples are very soft. Take the pot off the heat and allow to cool for about 10 minutes. Pour the cooked apples into the food mill. Discard any water than strains through the food mill, then puree your sauce. 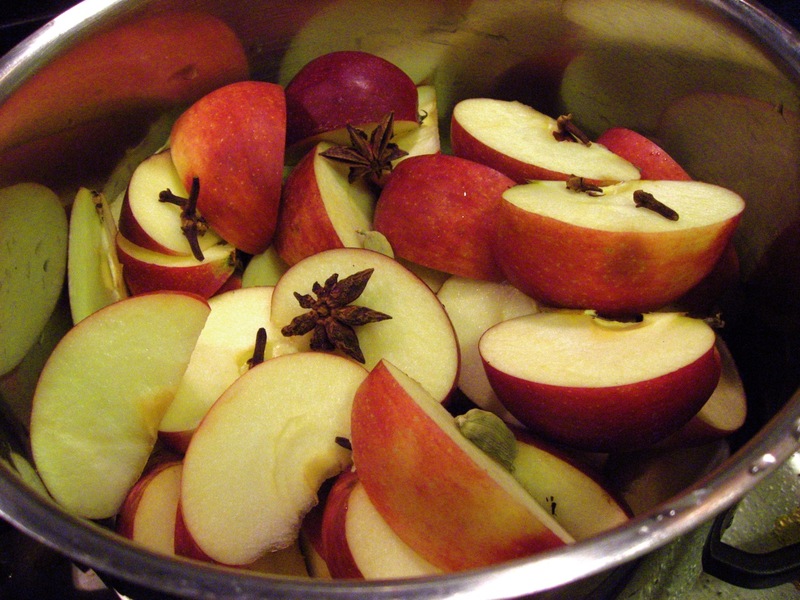 If you don’t have a food mill, remove the spices from the cooled apples and mash them with a potato masher. If the sauce is too watery, pour it through a fine mesh strainer. Store, covered, in the refrigerator. Use more than one apple variety for more complexity and depth of flavor. Try any spice combinations that sound interesting to you. Here are some suggestions: cinnamon, nutmeg, mace, fresh ginger, cloves, star anise, and cardamom. Whole spices are always better if you have them; for nutmeg, grate it into the pot. If your apples are old, you might add a tablespoon or 2 of sugar. Old apples also benefit from 2 tablespoons of butter for extra smoothness. Stir the butter into the finished sauce while it is still warm. For an adult apple sauce, use brandy or Calvados (French apple brandy) instead of water.